New Jersey legislative committees advance potentially groundbreaking adult-use cannabis legislation, an Ohio credit union offers limited banking services to medical marijuana companies, and sales are booming at Massachusetts’ first two recreational MJ stores. Cannabis businesses are chomping at the bit in anticipation that New Jersey could be the next state to legalize recreational marijuana, an MJ trade association official said. State lawmakers advanced a bill to the full Legislature for a vote, which could take place before year-end. 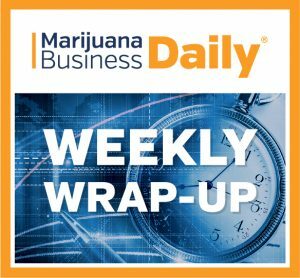 “A lot of people have been doing the groundwork, making relationships (and) forming teams since this last summer,” said Scott Rudder, president of the New Jersey CannaBusiness Association. He added that he’s seen everyone from mom-and-pops to multistate operators gearing up for the market. Some issues still must be hammered out, Rudder noted, but he expressed confidence the legislation will pass despite some reports it will be tough going. The bill could be voted on as early as Dec. 17, he said. The rate is currently proposed at 12%. Gov. Phil Murphy indicated he would prefer a higher rate, Rudder noted, but Senate President Stephen Sweeney is adamant it not go above 12% or the black market could flourish. Recreational MJ licenses would be issued for retail, grower, processor and wholesale operations, which should allow more opportunities for entrepreneurs than a vertically integrated-only structure, Rudder said. He also likes the bill’s intention to support minority- and female-owned businesses. But some of the language regarding the number of licenses to be issued is “nebulous,” Rudder said, with decisions subject to the arbitrary authority of the five-member cannabis commission. Are Ohio’s MMJ banking pains easing? An Ohio credit union’s decision to offer limited banking services to the state’s MMJ licensees could pave the way for more financial institutions to step forward, industry experts said. It’s not yet clear what services might be offered by Wright-Patt Credit Union or just how expensive they might be. Officials with the credit union, based in a Dayton suburb, did not immediately respond to messages left by Marijuana Business Daily. But Wright-Patt’s decision has fanned hopes that Ohio financial institutions may be more willing to serve MMJ clients – a move that would allow cannabis companies to avoid running cash-based operations. “There’s a growing sense of optimism with respect to what 2019 might bring,” said Patrick Haggerty, an attorney with the Cleveland law firm Frantz Ward, which serves MMJ companies. “What our clients are suggesting to us is that banks are no longer shutting the door in their face,” Haggerty said. Ohio regulators and a top banking trade group have been working to educate financial institutions on the rules and laws surrounding banking cannabis firms. The Ohio Credit Union League “supports the credit unions’ ability to lawfully serve these businesses that engage in activities that are authorized under state law, even when such activities may be inconsistent with federal law,” said Paul Mercer, president of the trade association. Meanwhile, the Ohio Department of Commerce has been hosting informational sessions for financial institutions considering doing business with MMJ firms, said Kerry Francis, a spokeswoman for the department. “Our goal is to make sure they have the information and education they need as they consider their choices,” she said. Recreational marijuana sales were brisk in Massachusetts after the first two stores with permission to operate in the state opened Nov. 20. Cultivate in Leicester and New England Treatment Access (NETA) in Northampton reportedly raked in more than $2.2 million combined within their first five days of operation. The downside for the towns where the two businesses are located have been long lines outside the stores and traffic jams that have angered nearby residents. Cultivate has shelled out more than $21,000 per week. NETA has spent more than $18,000 per week. The cost of police details shouldn’t raise eyebrows – at least not in Massachusetts – said Adam Fine, who heads the Boston law office of Vicente Sederberg. The firm represents MJ clients in the state who are in the final stages of licensing. He expects other marijuana stores that open in Massachusetts will offer to pay similar fees, partly because they may think it’ll hasten their application process. Fine also said residents shouldn’t be angry with Cultivate and NETA for the traffic issues. Instead, they should place the blame on the state’s Cannabis Control Commission, which Fine and other observers argue has been slow to approve store openings. “The lesson learned here is you don’t roll out just two at a time,” he added. Fine expects at least three or four more adult-use stores in the state to open before the end of the year.